There was the option of the ferry between Ettalong and Palm Beach, and I was keen to do this, but as we wanted to end up in Hornsby, it just wasn’t sensible at all. So, there’s the Patonga-Bobbin Head ferry service/cruise -$15 each + $4 for bike, one way. 11.30am depart Patonga . We’d used this on our Sydney/Hunter tour back in /09, and it’s still going. 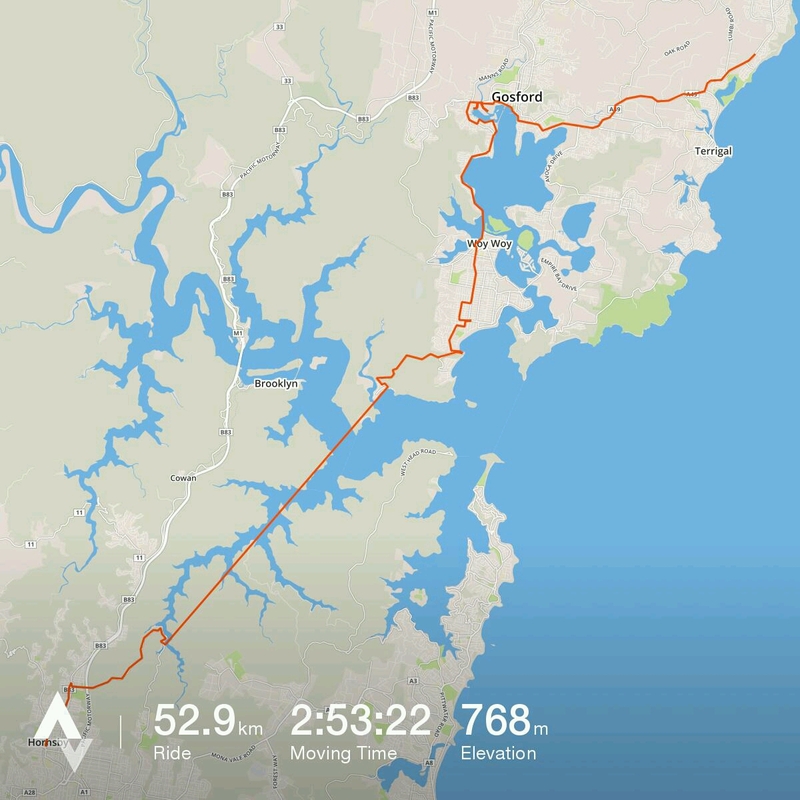 It meant we still had two climbs for the day – one out of Umina up and over to Patonga, and the other out of Bobbin Head. Despite them assuming gargantuan status in our – more like his – mind (down to my flagging a bit on a hill back on Day 6), they turned out to be not so bad. Back to the start of the day – so, (as mentioned at the end of Day 8’s map and notes post), we ended up being glad we stayed at ‘Forries’ Beach. After plotting our two route options – and elevations – to get to Patonga, we decided on going via Gosford instead of via Terrigal. There are a few ‘rollers’ on the Central Coast Highway which are a bit tortuous, but the other way (via Kincumber) looked worse. Early Sunday morning was a good time to do that Central Coast Highway section, before the traffic got up and happening. I’ve detailed our route mishaps getting out of Gosford here … so don’t follow that! And, if we did it again we wouldn’t bother with the ‘Coastal Cycleway’ shared path through Point Clare. It’s all very pretty, but slow, twisting, not signposted well, and in a couple of places, dangerous for a loaded bike (particularly the tandem). There is also another way out of Bobbin Head, up to North Turramurra.